A few months ago, the environment team at Marrickville Council (now part of Inner West Council) came by to film an interview with me, about our eco renovation. This has now been published, along with insights from two other houses. Enjoy, and I hope it will be useful! PS. the Inner West Council provides some great resources and support for households wanting to reduce their environmental footprint. Their team is passionate and effective, and I’d encourage you to get in touch. This entry was posted in Renovating the house and tagged house renovation, renovation. We’re honoured to be included in this month’s Sanctuary magazine, which is featuring a number of houses that have been involved in Sustainable House Day. This entry was posted in Renovating the house and tagged case study, renovation, sanctuary magazine, sustainable house day. On Wednesday June 26, Marrickville Council will be hosting a Sustainable Design Information Night. This event aims to give Marrickville’s residents an overview of the key elements of a sustainable house design and to provide residents with the opportunity to ask questions of an expert panel. It should be an interesting night, so if you’re in the Inner West, hope to see you there! This entry was posted in Local issues, Renovating the house and tagged house renovation, renovation. Looking through our living room to the backyard beyond. Lots of wood and warm colours. While we finished our home renovation about six months ago, it always seems hard to find the time to get some photos taken! We’ve already shared photos and details on our kitchen and pantry. These are some photos of our open-plan living/dining room. There’s a lot of eco-features here, including the rammed earth wall, double/triple glazing, LED lighting, etc. But I’ll leave all that information for a future post, and just share the pictures. From the living room, through to the front of the house. The rammed earth wall makes a statement! This entry was posted in Renovating the house and tagged double-glazing, glazing, house renovation, living room, renovation, triple-glazing, windows. Hire an architect or “building designer” to create a set of plans. Make a guess on the cost of the project, based on “$x per square m, multiplied by the size of the extension”. Use the plan and guessed budget to get council approval. Create a tender, outlining the project and a bunch of the details. Get three or more builders to quote on the job. Haggle, then sign a fixed-price contract. As we proceeded through the process, we started to have increasing concerns. The building designer was fine, although there were times when we felt he wasn’t fully listening to our needs. We also kept wanting to know when the details would be worked out, but were always told “later”. We liked the final plans, even though it took us twelve months to nail them down. How would we find an initial list of good builders to go to? Would they give us a meaningful quote, or just a quick guess? When did the uncertainties get resolved? What would stop us from getting hit with “death by a thousand project variations”? How could we assess the quality of the builder? If we were expected to pick the cheapest quote by default, wouldn’t that mean we’d get the shonkiest by default? 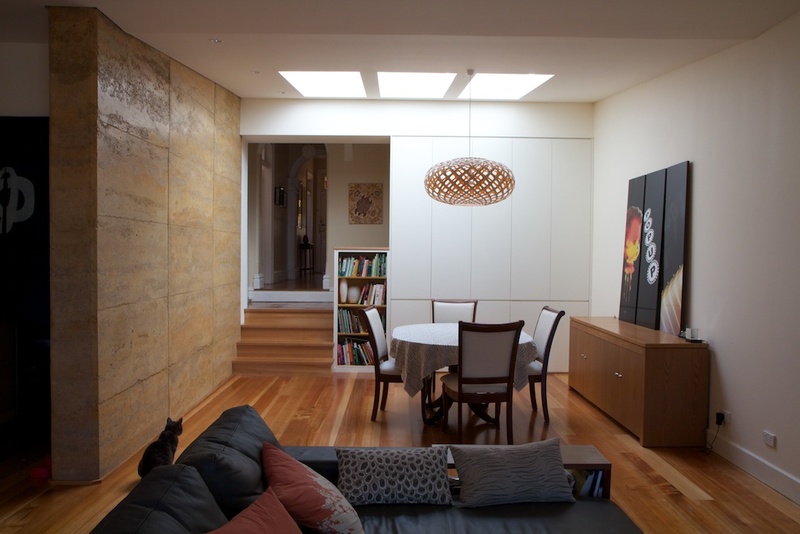 What about the unusual elements, like the rammed earth wall? How much was this actually going to cost? In the end, we stopped. And headed down the owner builder route, which we don’t regret. In my day job, I help companies run tenders and projects. This leaves me convinced that the “traditional” building route is fraught with problems, at least in the residential space. Uncertainties aren’t dealt with. There are easy bits to every building project, and there are the unknowns. We knew that strange things such as the rammed earth wall could cause problems, but it’s the unexpected things that get you. 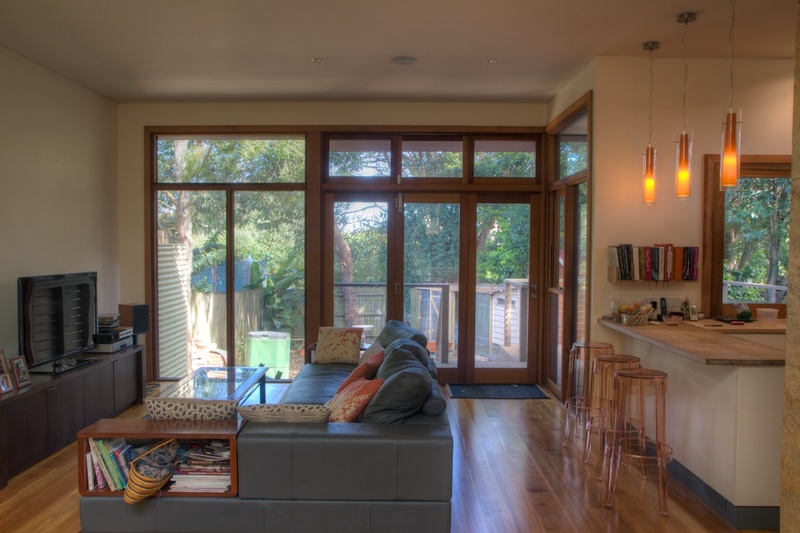 For example, our building designer had drawn a magnificent arrangement of doors and windows out onto the deck. Luckily, we thought it could be useful to get some early quotes to help with our budgeting, and quickly discovered that what had been drawn was unbuildable. Had this been a traditional approach, we only would’ve found this 1/3 of the way into the build, blowing out our budget, and costing us six weeks of time to resolve. Ouch! And this was just one of the uncertainties that would’ve lain in wait for us, had we gone down the traditional route. Costs aren’t managed. As a result of the issues outlined above, the builders’ initial quotes are little more than educated guesses. There also isn’t a reason for them to commit huge amounts of time during a tender to accurately assess things, leading almost inevitably to cost over-runs later in the project. Building materials aren’t carefully selected. The tendering builders make a set of assumptions about building materials when quoting, and these often aren’t the highest spec. Once building starts, it can be quite difficult to change materials, impacting on both quality and environmental impact. Cost trumps quality. It goes without saying that picking the cheapest builder hardly biases the project towards quality. Changes are hard. With a fixed price quote, it’s inherently hard to change things. And every change encourages the builder to inflate the cost of the variation. Speed discourages thinking. While modern building practices are very efficient, having a pile of trades on-site means decisions get made in a hurry, leaving little time for tuning and refining the design. In short, the traditional approach seems to virtually guarantee budget blow-outs, unpleasant surprises, and cut corners. No wonder there are so many horror stories of projects finishing 150% over budget, and a year late. Crazy stuff. Now I’m not saying that you can’t get a great house at a great price, going through the standard process. It just seems to me that the odds are stacked against it. While we went down the owner builder route in response to these concerns, I’m convinced that a more sensible approach to traditional practices could also get a good outcome. Such as exploring the uncertainties earlier, getting the preferred builder to do initial “scoping” to refine the cost and materials, and tuning the fixed-price/cost-plus models. What do you think? Should we be building houses differently? This entry was posted in Renovating the house and tagged house renovation, project management, renovation. We’ve had a number of tours visit our house, most recently, a group organised by Marrickville Council. While we haven’t done anything truly extraordinary, I know from personal experience that the most helpful thing can be sharing the little details, such as what materials to use, where to source supplies, or what contractors to use. So to help with this, we provide visitors with a fact sheet (PDF), containing a summary of what we’ve done. Hopefully you’ll find it useful too! This entry was posted in Renovating the house, Saving the environment, Useful resources and tagged house renovation, renovation, sustainability, sustainable house day. We recently purchased a Kina light for our newly-renovated dining room, “Kina” being the Maori name for the local sea-urchin. It was designed by David Trubridge in New Zealand. The light came as a flat-packed kit which reduces freighting, and only took an evening to assemble. It is made from plywood from sustainably managed plantations, and the inner surface is painted orange (other colours are also available). It makes a great centerpiece above our dining table and when the light is on it throws patterns across the room. Due to the story behind the object + the environmental aspects + the design I’d have to say this is one of the best furniture purchases we’ve made for our new extension. This entry was posted in Renovating the house and tagged house renovation, lighting, renovation.